It's quite literally blowing a gale tonight and I wasn't home in time to get a good shot of this in natural light so you'll just have to lump it I'm afraid - I've been trying to get a good picture for the last five minutes and have run out of patience! Pattern: Star-Crossed Sloutchy beret (Rav link) - third outing for this one and I actually used a smaller needle for the ribbing, for once! Yarn: Knit Picks Andean Silk - I really love this yarn; so soft, and has a lovely sheen about it in the finished article. Needles: 5.5mm and 6.5mm - I reduced needle size due to the thinner yarn. Mods: None, other than the needle size. Hence, the hat does not slouch the way it is supposed to; but it's for Mother Hand, and I think it will suit her quite nicely. I am officially, therefore, halfway towards completing the first of my December goals. 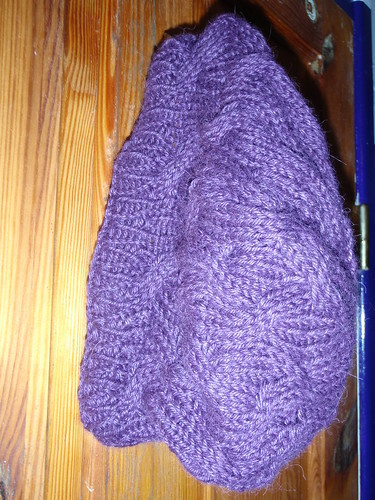 And I'm halfway through Sib's girlfriend's hat, so it looks like I'm going to make it. I also got very drunk at Friday night's Christmas party, so you can see I am really dedicated to my goals this month.